Still, six people were injured in a shooting. And the Cubs star was nearby. Again. ORLANDO – The Dominican shortstop for the Chicago Cubs Starlin Castro, was arrested Saturday by authorities for questioning by a shooting that left six people injured by bullets in the morning, reported the Dominican police. Colonel James Matthew Slimer, spokesman for the Dominican National Police, said that Castro is being held at the prosecutor’s office of Montecristi, northwest of Santo Domingo, where he was interrogated for his alleged involvement in the shooting that took place in a nightclub that city. The police spokesman said that some people close to Castro participated in the shooting, which left six people injured, including one in serious condition. Montecristi authorities said a man named Jeremiah Martinez was taken to hospital José María Cabral y Baez Santiago seriously injured as a consequence of the lawsuit alleged employees faced mayor of Montecristi with a brother and several bodyguards Castro. According to reports, Castro’s bodyguards stripped Tatis of a 12-gauge shotgun, which was recovered by police in the bushes next to the disco. Starlin Castro’s agent, Paul Kinzer, said his client “had nothing to do” with the shooting and was never detained by authorities. Kinzer said repeatedly that his client was never arrested. “He wasn’t ‘released,’ because he was never ‘held,'” Kinzer said. Cubs not commenting on report of Starlin Castro being arrested in connection with shooting incident in Dominican. I am working the story. Kinzer said Castro has spoken to Epstein, who apparently was unhappy with the latest incident, whether Castro is innocent or not. Kinzer conceded Castro, who has a young son, needs to avoid the club scene to avoid getting a reputation as a “thug” who hangs out with the wrong crowd. 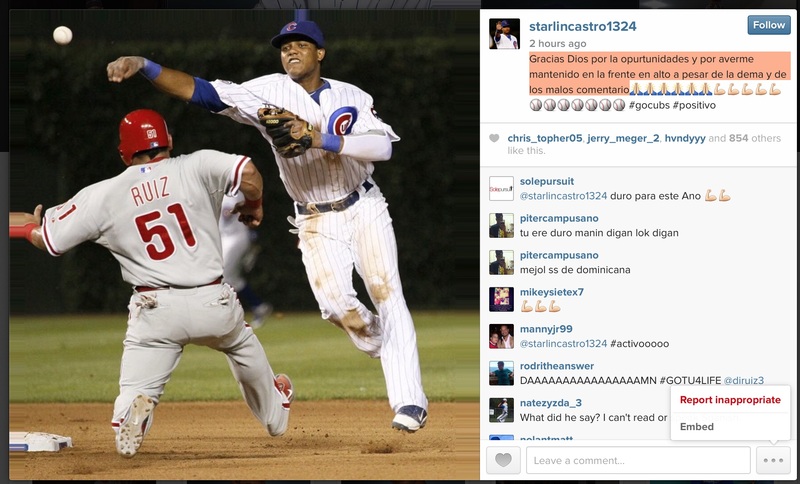 Translation: The home of the baseball player Starlin Castro was raided in the early hours of the morning. Translation: He’s thanking God for helping him get through the comments and accusations. This is just the latest in the string of troubles for Castro, who was accused of sexual assault in 2012 (he wasn’t charged) and earlier this month he was cleared of involvement in a nightclub shooting in the Dominican Republic. Castro is either doing dumb and/or dangerous things, surrounding himself with the wrong people or just happens to be one of baseball’s unluckiest players. One, two or all of these things can be true, of course.